Howdy everyone! My name is Gail Green. 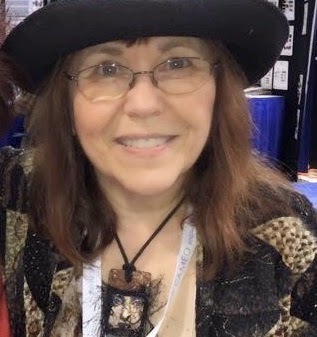 Many of you may know me as a columnist and advisor for Scrap & Stamp Arts magazine, as well as the published author of numerous magazine articles, projects, and books (The Ultimate Rubber Stamping Technique Book, Cat & Dog Lovers' Idea Book, Pretty Presents: Paper Creations to Share, and The Kids’ Guide to Projects for your Pets). In addition to being a rubber stamping expert and specialist in craft technique development and creative product combinations, I'm also the illustrator behind “Sweet PETatoes®”, a licensed brand featured on a variety of craft, rubber stamp, gift, stationery, pet and party products. Direct link to my blog is www.gailgreen.blogspot.com Over the next several weeks and months, I'll be posting creative projects using Linnie Blooms awesome canvas products and a variety of mediums and techniques. So thrilled to be a part of the Linnie Blooms Design Team... Let the creative begin! It will be fun to work with these awesome products and share the fun with everyone !